EasyCart comes with a gift card system. To understand how the gift card system operates, think of gift cards as their own little credit card with cash on it that can be redeemed at your store. Gift cards are redeemed during checkout, and the customer can enter a gift card ID number to redeem the value on that card. If money is left over on the gift card, it can be used another time. To create a gift card, enter a 12 digit unique code for the user, the amount that is on the gift card, and a custom message to the user that they will see after entering it into your website. Two methods to actually create gift cards in your system. The second method is you manually create the gift cards here in this section. You are then responsible to distribute the unique gift card code to the user using any means you feel necessary. 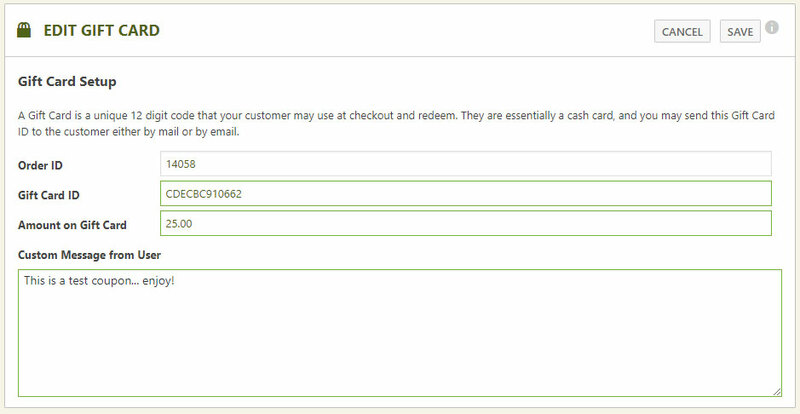 Next, the user has the gift card code and enters it during checkout. If the total of the order is more than the gift card, the user will see the total discount and then be responsible to checkout and pay for the rest of the items as usual. If the total of the order is less than the gift card, then the money is deducted from the gift card and the customer may use the remainder of the gift card at a later time. Gift cards in EasyCart are designed to run fairly independant. You should not need to administrate them much, but if you need to, you can check totals here in this location. At the order level, you can see when a person purchases a gift card, the unique ID will be shown in the order, along with the ability to resend the recipient the actual gift card email with all this information on it should you need to.